Legal SEO is the practice of making your website show up higher in search engines, like Google and Bing, when people search for your services. Most mobile users click on the first search result they see. 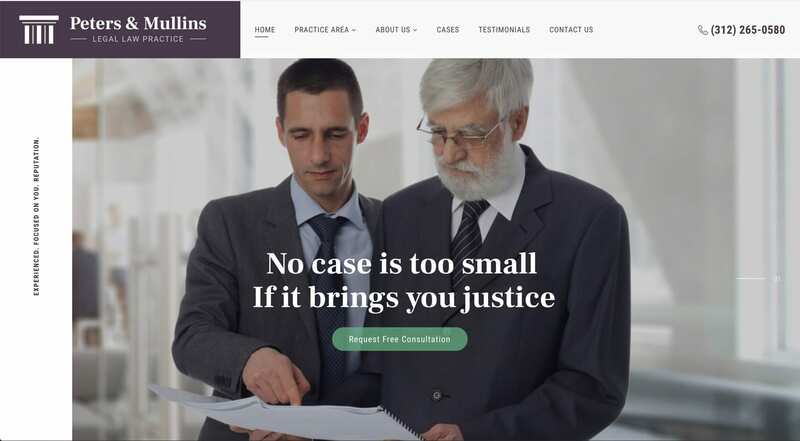 In fact, a recent study shows that 22% do just that, which means if you want your law firm to be successful and to consistently attract high quality leads, with minimum investment, the best way to do it is to ensure your website is on top of the search results on various search engines — or at the very least, it needs to show on the first page. 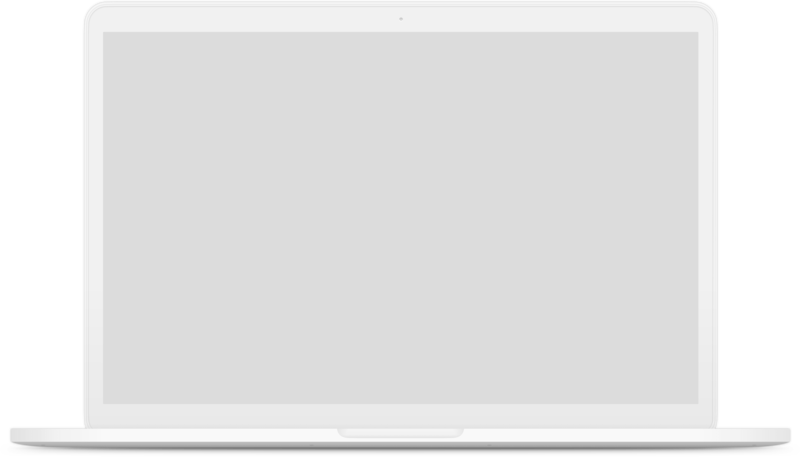 In order to rank on the first page for certain keywords, you must have them on your homepage, used in a certain way and with a certain density. Little details like this, plus making sure there are at least 1,000 words below the fold describing in detail what your practice is about and what you offer to clients, will ultimately determine the results you see. 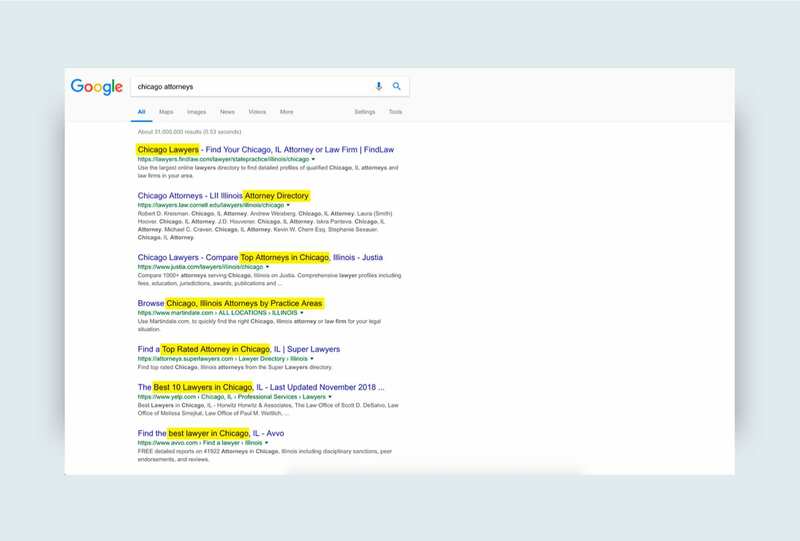 By using our Chicago based legal marketing company, you take advantage of the most progressive SEO tools and legal writers to create what people want to read and dominate Google simultaneously. 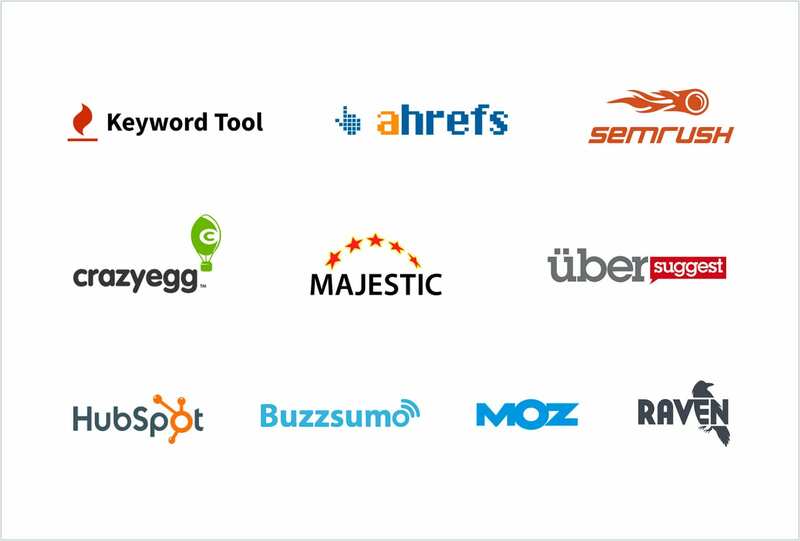 We use tools like Scoop.it or BuzzSumo, as well as our deep understanding of new Google algorithms, to guarantee quick and lasting results, which is what makes our SEO service a worthy long-term investment. No black-hat SEO! 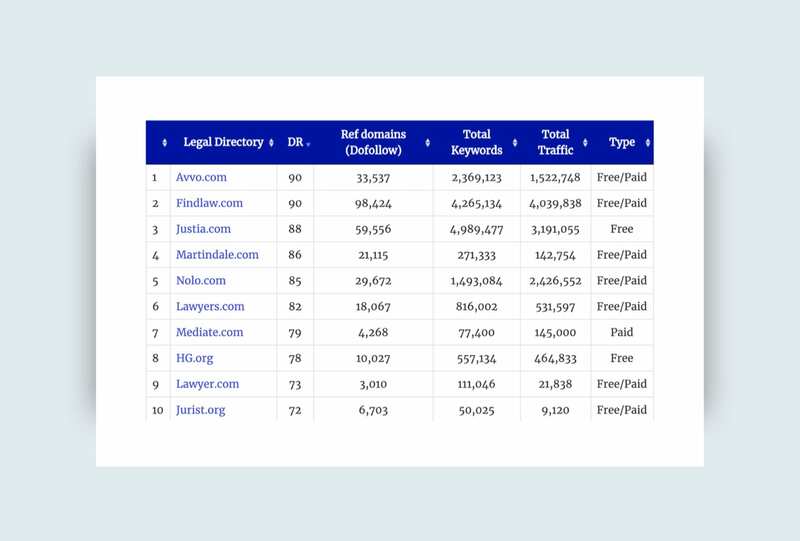 For law firms, which usually offer their services within a certain area, using good local SEO practices for attorneys should be a top priority. These are very different from regular SEO, because they put emphasis on the local pack. The local pack is the box of Google Map results in the search results page, under the paid ads and above the organic search results. 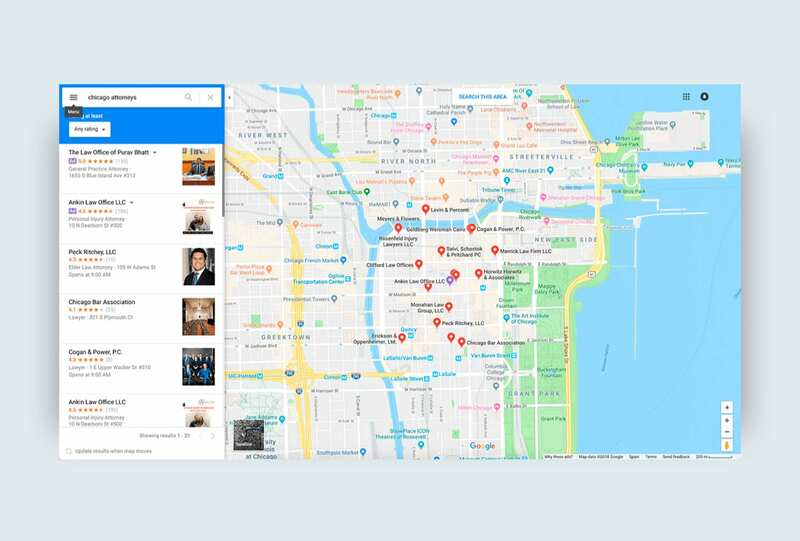 The information in the local pack is pulled from your Google My Business Account, which is why your GMB account needs to be claimed and optimized for local SEO. Is your business on relevant online directories? Your Google My Business profile isn’t the only profile that needs to be optimized for that local pack to work. One part of attorney local SEO is finding relevant online directories, and continuously optimize those listings. 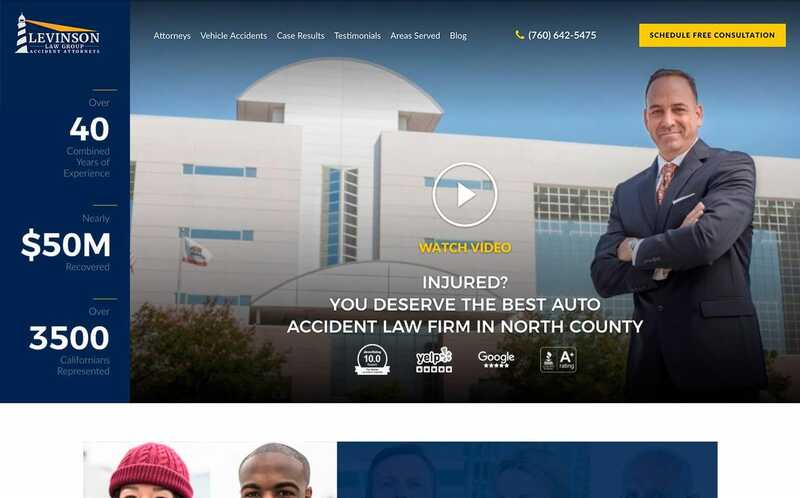 Important attorney’s directories are avvo.com, findlaw.com, attorneys.com and Justia, and then there are non attorney directories and social platforms that also matter: Yelp, Google, Facebook, Instagram. Very often law firm’s name, address and phone number across all those websites is inconsistent, which leads to poor SEO results. Another thing that’s extremely important about your profiles on all these platforms are the reviews. Due to their comprehensive integration with Google, your potential clients have the chance to see the overall feedback from your services before they even click on your website. You can read more about how we help you manage your online reputation — which affects both your SEO and your conversion rates — in our Reputation Management service description. Not all keywords are created equal, and we’re not just talking about volume of search and competition. 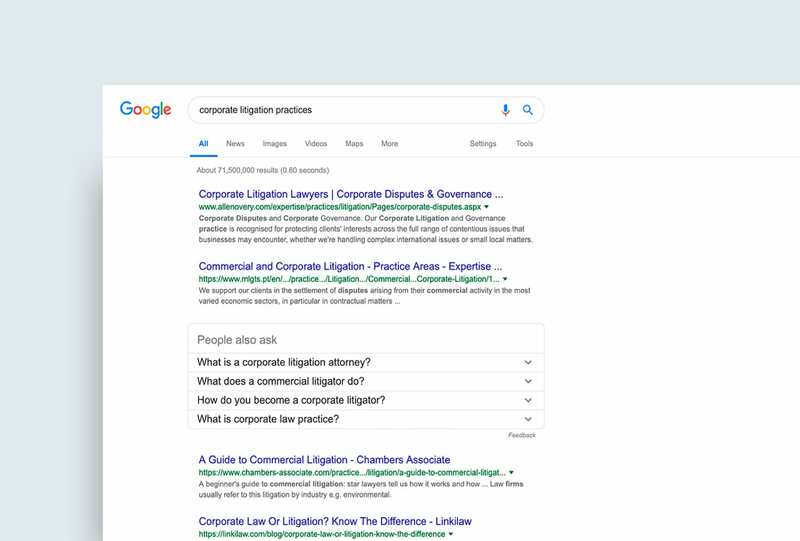 For every legal industry, there are specific action-related keywords, which means prospects who search using these terms usually take immediate action. For law firms, these are phrases like “legal advice for retirees” or “corporate litigation practices”. Optimizing your page for such words means attracting potential clients that pick up the phone and call you, instead of ones that are just doing research. Our 10+ years of experience doing SEO has allowed us to perfect our legal-specific SEO approach and has made us extremely detail-oriented. We add relevant markup and keywords in titles, images and heading tags; we optimize your visual content by using keyword-rich descriptions; adding schema for attorneys (schema is extra website code that helps search engines understand what your web page is about) and continuously working on offsite local SEO and content marketing. 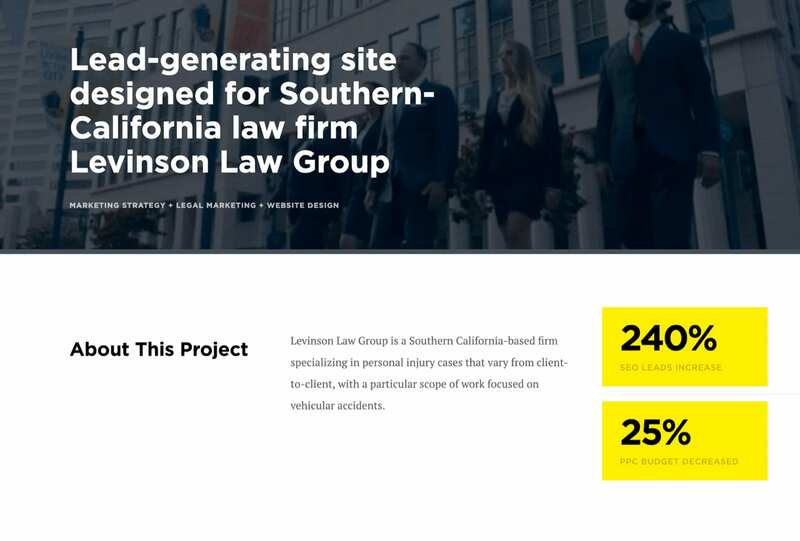 Our Levinson Law Group project is a perfect example of how the untapped potential of legal SEO is costing you money. 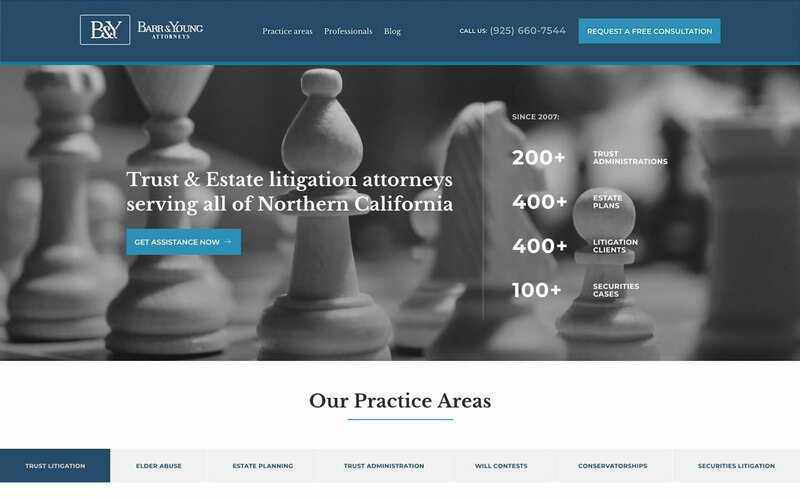 When they first came to us, this Southern-California based law firm relied heavily on paid advertising, getting clicks which, unfortunately, weren’t turning into paying clients due to a poorly designed website with out-of-date content. After completely re-doing their website and creating and implementing a relevant SEO strategy, we increased SEO leads by 240%, in addition to also improving the results from their paid ads.